Photographing light trails is somewhat of a rite of passage for low light photographers – usually by setting up a nice landscape composition that includes a stretch of road and waiting for the right time when traffic is passing with their lights on. 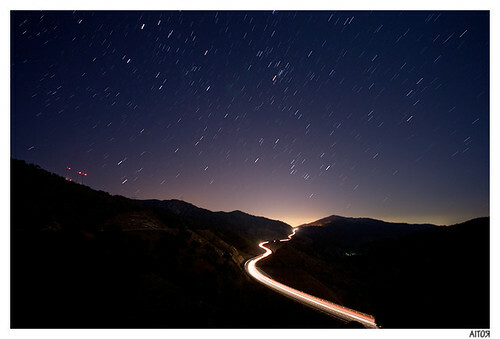 If you want to grab a similar shot know how to photograph light trails, then you're in the right place! As you have probably figured out, light trails (aka “traffic trails” or “car light trails”) are basically made by combining a stationary camera, a long exposure and moving lights. With traffic, as the vehicles are moving through your frame, they are essentially invisible in the final shot leaving only the trail of their bright headlights or tail lights. What Gear Will You Need for Photographing Light Trails? One of the great things about shooting light trails is that it really doesn't require a lot of gear. Basically, a camera and a stable place to put it are the essentials. In practice that means a camera, a tripod and a remote release. What's the Best Time to Shoot Light Trails? 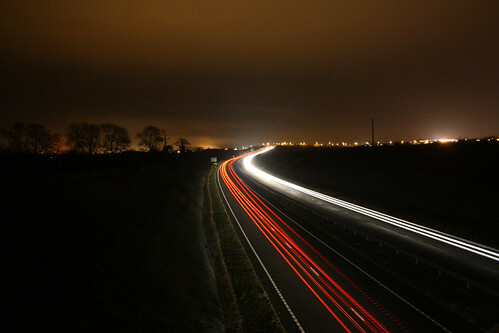 Light trails can be shot in most low light conditions. 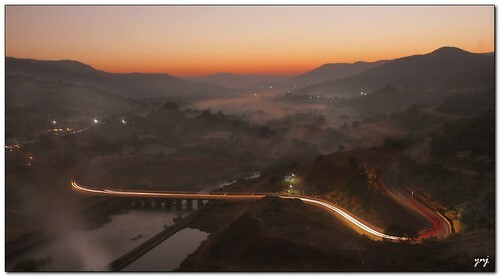 Many of the most remarkable shots, however, are shot just after dusk in the blue hour. (Theoretically the hour before dawn works too, but it can be a lot harder to find a lot of cars or traffic on the roads at that hour). 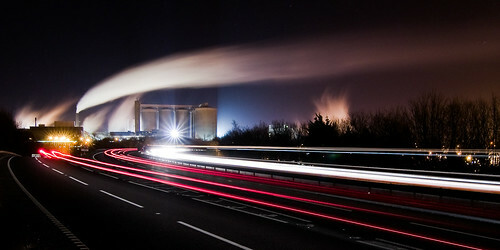 Many people also shoot remarkable light trails in fully dark conditions. It's also possible to shoot late in the Golden hour such as in the shot below. Light trail shots are like any other. You need to compose them well. Ask yourself if the shot you are taking would look any good without the light trails. Try to experiment with traditional landscape compositions to get the one you most like. You might want to make reference to the Rule of Thirds, the Golden Section or other composition conventions (or throw out the lot), but make it deliberate. Just because you are shooting light trails doesn't mean that the image will look great without other traditional elements that make a good photograph. As you are shooting in low light and it can be difficult to see all of the elements, fire off a couple of test shots at a high ISO. This allows you to get the test shots done quickly and see them on your view finder. Don't worry about noise etc – this is just to establish that you like the composition of the shot you are taking in the quickest way. With your test shot out of the way, and your composition decided, you will then want to start considering camera settings. Obviously you are going to want a long shutter speed, while allowing as little noise into your final image as possible. That means you will want to flick the ISO down low – probably to 100. If you want to keep as much of the frame in focus as possible (as you usually would) you will also want a narrow aperture. Somewhere between f16 and f22 will probably be about right. (Obviously this is for a wide depth of field. 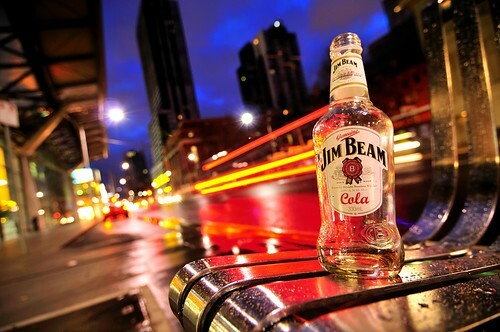 If you want a narrow depth of field (such as in the photograph of the Jim Beam bottle below) you will need to open up the lens with a lower Aperture setting). A narrow aperture will also give any stationary lights a “starburst” effect which is usually considered a good thing among many photographers. Finally you will need to set your shutter speed which will largely be determined by the first two settings. This will need to be long enough to get the trail effect of the lights moving through your frame. Make sure to use either your remote release or delayed timer on your camera so that you don't move the camera while the shutter is open. Note: A shortcut to figuring out the shutter speed is to shoot in Aperture Priority mode, but remember that this can sometimes fool the light measurements of your camera. If that happens, then you will want to shoot in manual mode to adjust for it. Shoot a couple of frames at different shutter speeds and be sure to check your histogram to make sure you aren't losing any detail. If you are confused about these settings, have a look at our explanatory article on the exposure triangle. If you did everything right above, then you probably already have a very workable image. 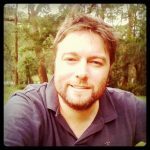 If you did it perfectly, you may not even need any post production. But sometimes these shots can use a little of the following helpers. Remember – go easy here – you might want to use one or all of these, but you shouldn't need to move any of them more than a little. Hopefully by this stage, you should be getting an image close to what you wanted to achieve. Shooting light trails can be a ton of fun and produce some great results. Share yours in the comments!